It’s National Baking Week! And surely there’s no better activity to do with your kids than a little homemade baking. Of course, you may have to put up with a some chaos, and spend a while cleaning up afterwards, but nothing beats the joy of sitting down to a cup of tea and delicious home-made cake. If you’re busy, it’s not always easy to choose a recipe, so I’ve done a round-up of 25 beautiful baking recipes to make life easy for you. Being British, I’ve focused on finding some traditional recipes from the UK, which may not be familiar to you if you live elsewhere. This entry was posted in Food and cooking and tagged baking, bread, cakes, cupcakes, flatbread, muffins, National Baking Week, tea bread on 20th October 2016 by emanneh. It’s National Poetry Day! I’ve always loved poetry. My mum says I could repeat many poems from A.A. Milne’s ‘When We Were Very Young’ by heart before I was two years old. 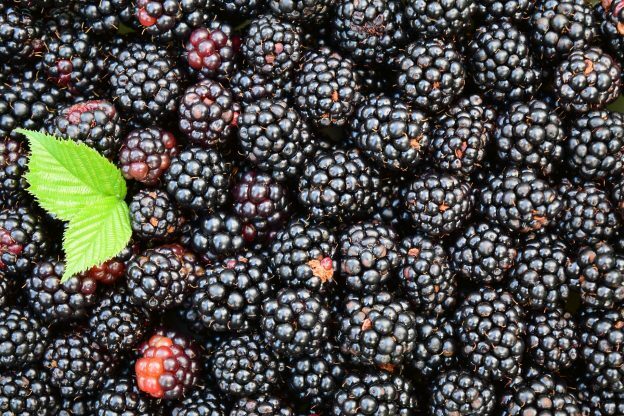 So I thought about which poem to share with you today and decided on one of my autumn favourites – ‘Blackberry Picking’ by Seamus Heaney. 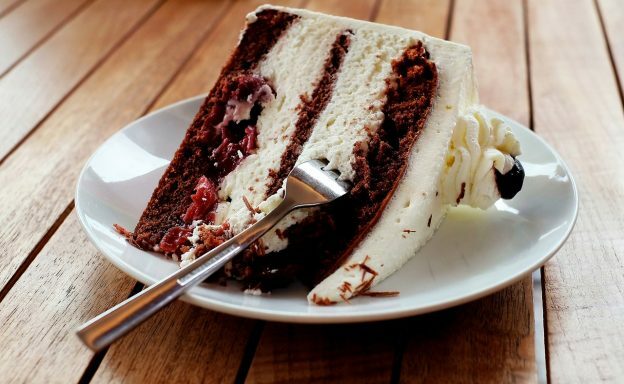 This entry was posted in Food and cooking and tagged blackberries, blackberry, blackberry desserts, blackberry drinks, Blackberry recipes, savoury blackberry recipes on 6th October 2016 by emanneh. In honour of National Gardening Week, I thought I’d round up this mini-series on gardening with an international flavour. 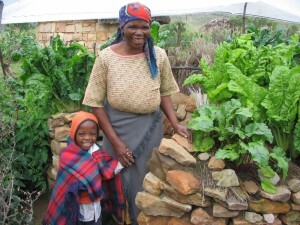 A while ago, I came across a fabulous concept for creating a small-space garden – the African keyhole garden. This idea ticked lots of boxes for me. I love gardening, and I’m especially interested in growing vegetables, sustainability, and gardening in a small space. I also live in Gambia for most of the year, so I found the whole idea of the African Keyhole Garden very interesting. (I’m wondering about trying to develop my own keyhole garden here – watch this space!). And a keyhole garden would be a perfect way to get kids involved in starting their own garden. A keyhole garden is a raised construction, shaped with a keyhole-shaped recess in the centre, that makes it possible to reach all the plants which are growing there very easily. Some designs leave the centre open – rather like the circular hole at the top of a keyhole. 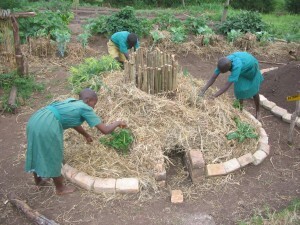 And some have a basket in the centre so you can add materials for composting and water the garden from one point. Grey water can be used for watering, and food waste is made into compost, so the whole idea is very sustainable. The idea of the keyhole garden was first born in Lesotho. Unfortunately, there were many people in this country suffering from HIV / AIDS, and the idea of a garden which could be worked by someone in poor health grew from a desire to help. An open centre meant that the gardener could lean against the side of the bed and reach the entire growing area without needing to move around – ideal for someone who’s got little strength. 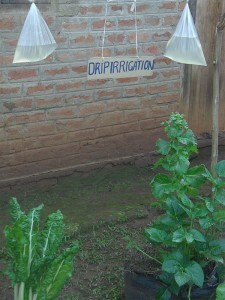 In time, others began to see the benefits of this design, and now they’re commonly used in several countries in Africa. In fact, even some western gardeners have been cashing in on the idea, building their own versions. Sometimes the original design concept is adapted, for example, making a low-level garden, perhaps because materials are limited. 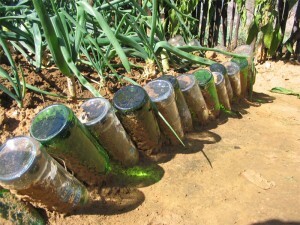 One ingenious idea is to use inverted bottle to create a wall – I’ve seen that here in Gambia to outline paths! 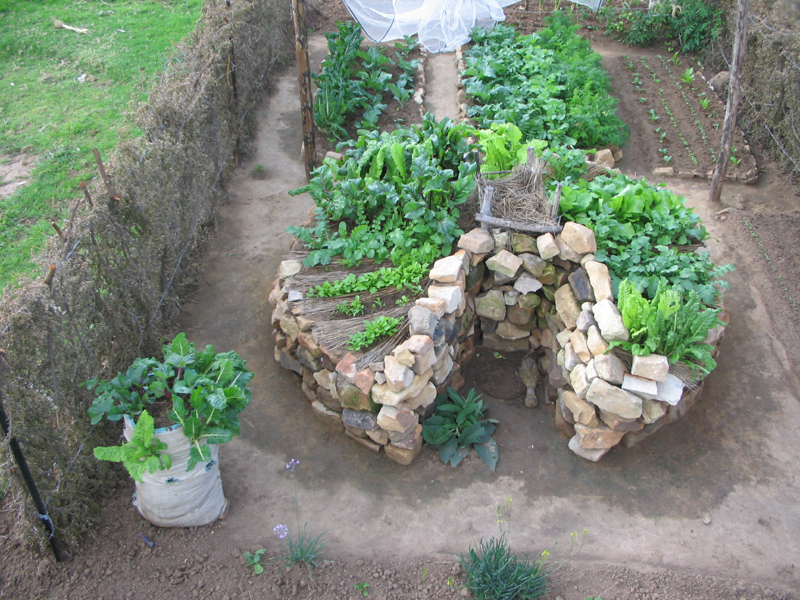 A keyhole garden is a fabulous way for people to grow their own vegetables with limited resources and very compactly. How can I build a keyhole garden? If you’re gardening in a small space, or simply like the compact nature of a keyhole garden, it’s fairly easy to construct one yourself. Permanent Culture Now has some great instructions using house bricks, with a ready-made composter in the centre. But you can also make on out of recycled materials, such as wooden pallets, as well as sustainable options such as mud bricks. Begin by laying out a circle of bricks, with a recess so you can reach the centre of the circle. You can place a composter in the middle, or use wire to create a compost hole, and check you can reach across to the edge of the garden. Then you can build up the layers until the bed is about as high as your waist. Make very sure this is stable before adding compost! When it’s ready, fill your garden with compost. You could buy this from your local garden centre, or use topsoil from your garden, but if you opt for your own soil, be sure to add some nutrients e.g. some fertiliser. In Africa, gardeners often put tin cans at the base to add iron to the soil, and perhaps add wood ash as well. Once completed, you can plant a few examples of a variety of vegetables, or just stick to a couple of basic crops. Water it regularly through the centre (you can use grey water like the Africans), or you could add a simple continuous watering system. Keep the composter topped up with food waste, grass clippings, green manure, garden waste, or eve cardboard and newspaper. You can also use mulch, such as grass clippings or hay, to help conserve water. And before you know it, you’ll be enjoying your own freshly grown vegetables! 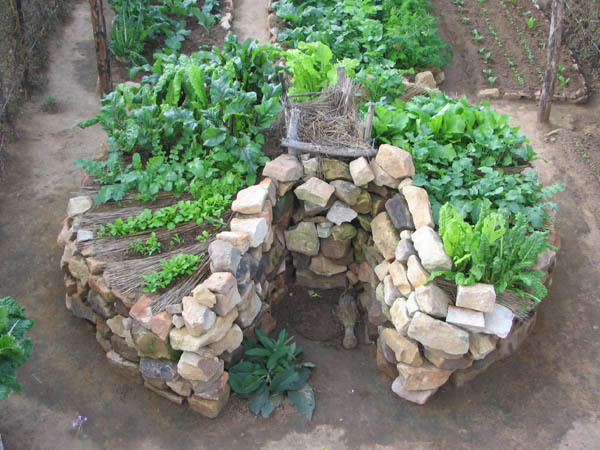 Even if you don’t decide to build your own African Keyhole Garden, you can see how fantastic this design is for those living in developing countries. But sadly, even a few basic materials can be beyond the reach of many people living there. So why not make a donation to charity to give someone in Africa a chance to have their own keyhole garden? Send a Cow is a charity doing some great work in Africa. 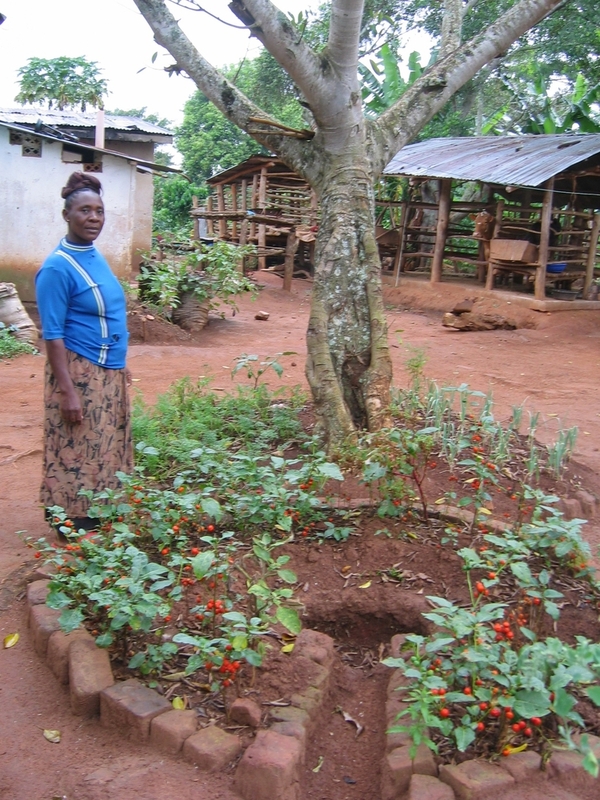 It only costs £14.00 to donate a Keyhole garden to a family. You can see lots of information about keyhole gardens on their site, as well as lessons for school teachers, photos, and a video. So take a look, and for a small amount of money you could change the life of someone living in very difficult circumstances. All images courtesy of Send a Cow educational resources – used with kind permission. 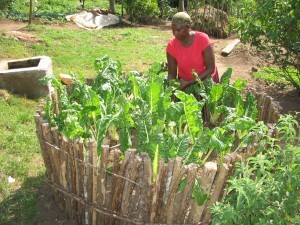 This entry was posted in Food and cooking, Gardening and tagged african garden, African keyhole garden, Grow your own, Growing food, growing vegetables, how to grow vegetables, Vegetable growing on 12th April 2016 by emanneh. I must admit I feel a little sorry for the potato. This humble vegetable often gets a bad press, labelled as fattening and unhealthy. In fact, it’s often the first thing people decide to ‘cut out’ when they want to lose weight. But potatoes are one of the healthiest choices you can make – it’s only what you eat with them that can make them unhealthy! They’re an important source of fibre, and filled with vitamins such as Vitamin C and Vitamin B6. They’re also very versatile – you can use them to accompany a meal such as your Sunday roast, as a staple ingredients of affordable meals (e.g. Cottage Pie or Cornish Pasties), and nothing tastes better for lunch on a chilly day than a jacket potato. So with so much going for the potato, why don’t people grow them more? Well firstly, if you grow them in traditional rows, they take up quite a lot of space. You may also have heard they’re tricky to grow, needing ‘earthing up’ and other such strange practices. But in reality, they’re not difficult to grow at all, and there are many ways to cultivate them that doesn’t mean giving up half your garden! The most important thing to remember is to prevent light from getting to the potatoes as they grow. That’s why gardeners pull the soil up around the potato stems (the fabled ‘earthing up’). But growing potatoes in a container avoids the need for all that, and also saves on space too. And kids will find it much easier to get involved with growing potatoes if they’re in containers. Simply fill your container half full with compost, place the seed potatoes in, and cover them up with a bit more compost. As the new leaves poke their way through, add more soil, little by little, until the bag is full. Keep well watered (but not soggy) and once the leaves start to droop, your potatoes are ready to be dug up. Harvested potatoes will keep for a long time by in a bag or sack – just be sure to put it in a cool, dry place that’s completely dark. 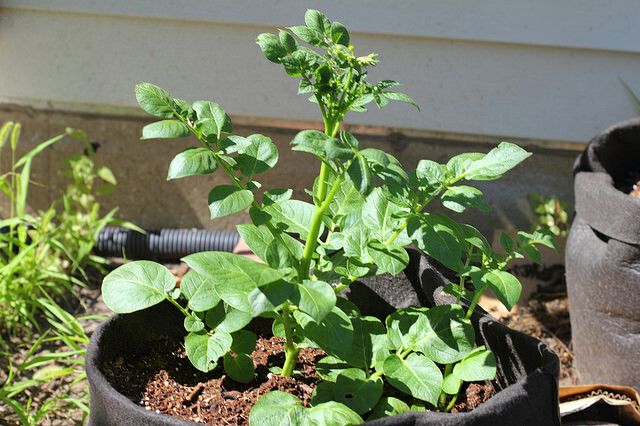 Of course, you can go out and buy a fancy potato grower, but if you want to grow potatoes on a budget, here are seven alternative containers you can make or use. You can get two or three plants into a large sack, which makes this a good option if you just want a few potatoes. Hessian or paper sacks are perfect – just make sure you’ve dusted them out inside if necessary before you plant your spuds. Naturally, you can always plant up several sacks if you want more plants. Large shopping bags are also a good choice, and a great way to recycle bags that are a bit worn out. Natural materials are best, because they allow for good drainage, but even synthetic ones (like Ikea bags) are fine if you punch a few holes for the water to escape. 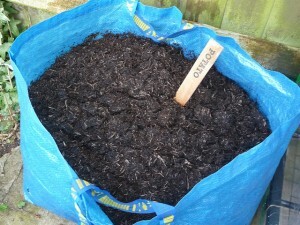 Have you ever wondered how to use up your old compost bags? Well, now you have the answer. 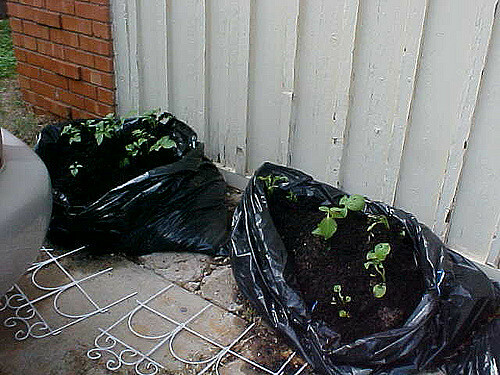 Potatoes grow superbly in old compost bags, but again, remember to make some holes for drainage, because potatoes can rot easily if the compost is too damp. 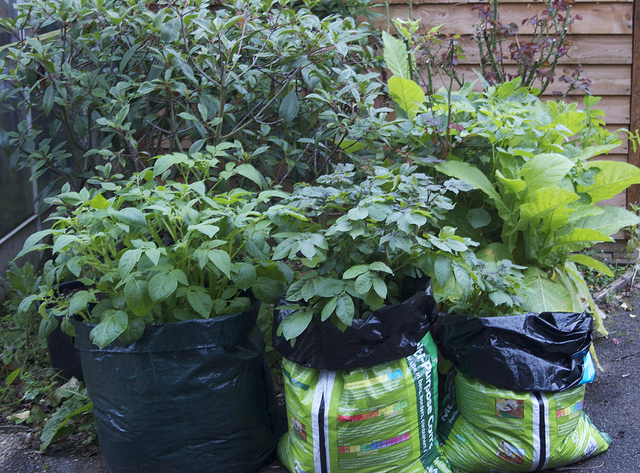 You need quite strong dustbin liners to grow potatoes, as the thin ones can split too easily, spilling your compost everywhere. Look for heavy-duty or rubble bags, punch a few drainage holes, and away you go! Weed suppressant fabric is superb for growing potatoes, because it allows water to drain through it but stays strong even when wet. Staple the fabric into an impromptu sack shape, making sure there are no large holes for the compost to leak out. These bags won’t last forever, but they’ll certainly do you for a couple of seasons. Again, cardboard is great because it allows water to drain through easily, so your potatoes won’t be rotting away in water-logged compost. However, you may find the base gets a bit fragile after a while, so choose your location carefully and don’t move the box once it’s planted up. You may have heard talk about growing potatoes in old car tyres, and this was certainly quite a common practice years ago. You begin by filling an old tyre with compost and planting your potatoes, then add more tyres and compost as the plants grow. It’s true you can grow potatoes well this way, but many people have concerns about the fact that chemicals could leach out from the tyres and affect your crop. Research so far has been inconclusive, but if you are considering using car tyres, think carefully before going ahead. Some of the other options above are far more natural. So why not give growing potatoes a try? There really is nothing like digging up potatoes for a meal and eating them straight away – they taste delicious and you’ll have the satisfaction of knowing you’re eating home-grown produce. This entry was posted in Food and cooking, Gardening, Healthy eating and tagged child-friendly gardening, gardening with kids, Grow your own, growing potatoes in containers, growing vegetables, how to grow vegetables on 8th March 2016 by emanneh. Now you’ve collected seeds to get started on growing your own vegetables, you’ll be desperate to get going. Again, you could go to the garden centre and buy a stack of seeds trays or small pots, but this can be an expensive option. However, with a little imagination, you can find free or very low-cost options for growing your plants, which will help keep things within your budget. And as an added bonus, you won’t be contributing to the world’s plastic mountain by buying plastic pots and trays either. You don’t have to have containers that are perfectly shaped or necessarily rectangular – almost any shape will do! So here are ten free alternatives to shop-bought seed containers. Flat shallow trays are best for seeds, and ideally you need a little depth too – the very shallow ones won’t give room for the tiny roots to get properly established before you move them to larger pots (known as ‘potting on’). If there are larger holes in the bottom, line the tray with newspaper or kitchen paper – this will stop the soil swilling out when you water, and help retain water for your thirsty seedlings. If there are no holes, punch a few with a skewer, otherwise your compost will get waterlogged and your seedlings will drown! You can also use egg boxes or cut sections of toilet roll – great for starting individual seeds such as squash or pumpkin! 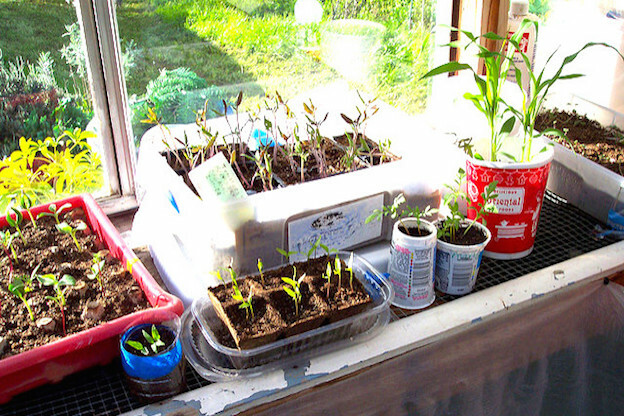 The largest-sized plastic milk containers also work well as seed trays. Use a very sharp knife (e.g. a craft knife), to divide the container in half vertically, then lay each half on its side to make a container – two for the price of one, but be careful when you’re cutting! You’re not going to have your seeds in their initial containers for very long, so biodegradable containers are a great choice. A large cereal box with one side removed makes a superb seeds tray. However, it won’t be very stable once it’s wet, so you may want to place it somewhere where it doesn’t matter when water runs out of it, such as on a plastic kitchen tray. Cardboard juice containers also make good seed trays, and they’ve got the added advantage of having a waterproof lining and being relatively stable. Remove one side and lay the container down, before filling with compost and sowing your seeds. Many food tins nowadays have ring-pulls to open, which means you don’t have sharp jagged edges around the top like the tins when I was younger. Remove the label and rinse the can out well, then punch a few holes in the bottom – try using a bradawl or even a stout nail and hammer for this. Again, they won’t last forever, but they’ll do very nicely for a while. If you’re a bit creative, have a look online for instruction for making origami boxes, and make some out of newspaper, Again, they won’t be very stable, and won’t last forever, but they’ll certainly do the job for the amount of time you’ll need them. It’s also possible to make small pots out of newspaper. These are superb, because they’ll hold their shape reasonably well when they’re wet, but biodegrade easily. In fact, you can just pop the whole pot and seedling straight into the ground when it’s time, so the roots won’t be disturbed, which can slow the growth of your plants. You could use an expensive wooden ‘mould’, but why not try a cheaper option? Check out this great tutorial on Garden Betty. 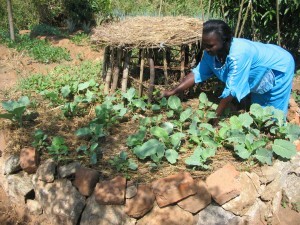 You can buy canvas bags or sacks for growing vegetables, but they’re not really a cheap option. However, if you’ve got some old shopping bags you don’t need (Lidl or Ikea bags are great), you can use these to plant vegetables. These are especially good to plant potatoes, but you can grow all sorts in them with a little imagination! You may be lucky enough to have an old stone sink or tray laying around that you don’t need – buying a new one is definitely not very affordable! Make sure it has a drainage hole – a plug hole will need to be covered with a piece of broken pottery or something similar, so you don’t lose too much soil when watering. A layer of gravel in the bottom will also help with drainage. It’s probably true that you can grow vegetables in almost any container, providing it’s deep enough to allow good root growth for the crop in question. Try wooden satsuma crates, an old wheelbarrow, shoes and boots with holes in, or an old washing up bowl. Once you start imagining, there’ll be no stopping you! Check on the internet for growing instructions for the crops you want to grow. You can start lots of them indoors, such as on a sunny windowsill, if you don’t have a greenhouse. And if you do sow some seeds in an ‘alternative container’, do let us know in the comments! This entry was posted in Food and cooking, Gardening, Healthy eating and tagged gardening, Grow your own, Growing food, growing vegetables, heathy eating on 27th February 2016 by emanneh.